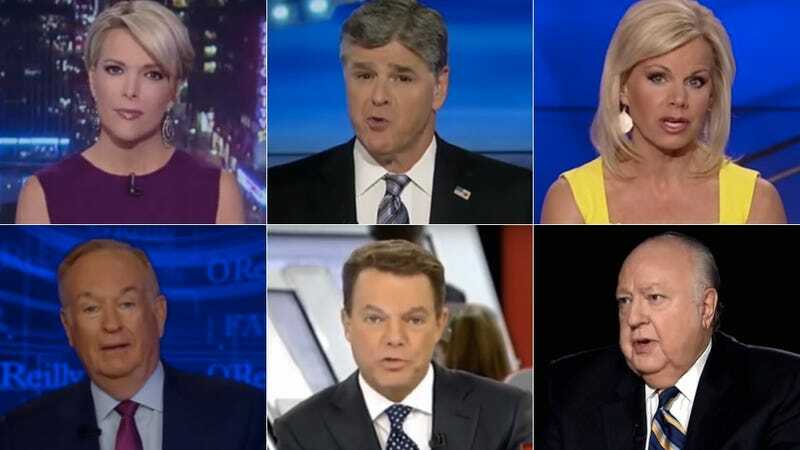 Fox News’s 20th anniversary is today, and everything is going really well on their end. Sean Hannity and Megyn Kelly are great friends, no one is suing anyone for sexual harassment, and Hillary Clinton recently spontaneously combusted, raining a cascade of green goo and Benghazi dust onto a New York City sidewalk. Here are some things you can do to honor this special day. 2. Remind your friends and loved ones that Santa is actually white. 4. Refuse to believe the testimonies of multiple female colleagues who alleged that your disgusting boss sexually harassed them. 6. Construct an argument around a completely made-up poll, chart, or graphic. 7. Get very angry with Beyoncé. 8. Ask groups of white men for their opinions on women’s interest topics. 9. Suggest that perhaps we ought to get rid of Black History Month. 10. Treat conspiracy theories like interesting facts. 12. Photoshop pictures of people who are smarter than you to make them look like 12th century anti-Semitic propaganda. 13. Suggest that an innocent teenager deserved to die. 14. Have a public meltdown. 15. Fall in love with a demagogue. 18. Tell a liar he’s right. 20. Blow out your hair, put on high heels and a curve-hugging dress, and walk around a Bible in circles for several hours until you finally collapse.